An alarming new meta-analysis published in the journal Nutrients titled, “Cardiovascular Effects of Calcium Supplements,” brings to the forefront the serious though mainly downplayed health risks associated with calcium supplementation, concluding they increase the risk of heart attack by 27%-31% and the risk of stroke by 12%-20%. Furthermore, women in the US and Westernized countries die primarily of heart disease, with cancer a close second, and not complications associated with a bone fracture. 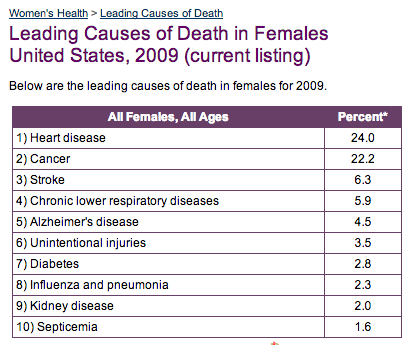 [see CDC’s top causes of death in females from 2009 below; osteoporosis doesn’t even make the top 10]. Insofar as calcium supplementation increases the #1 cause of death in women, their use constitutes a serious, avoidable health risk, removing entirely any justification for their promotion in improving the overall health picture of women. Considering that nearly 1 in 4 women will die of heart disease, reducing the risk for such an event is extremely important. 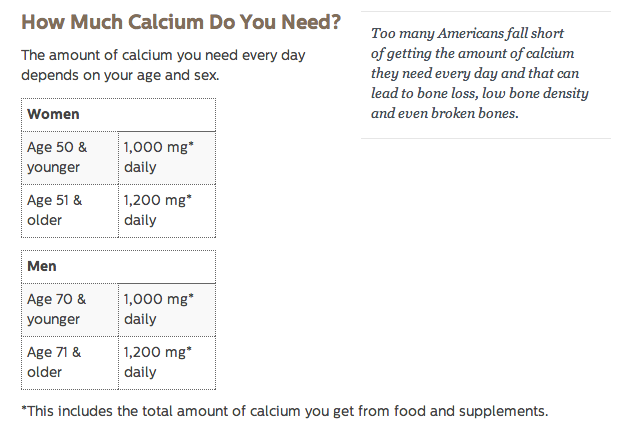 Therefore, the National Osteoporosis Foundation (NOF) calcium supplementation guidelines (see screenshot below), which suggest women consume between 1,000 mg-1200 mg calcium daily (a range which would require most women take supplemental calcium), place women at significant risk of harm. Considering the NOF name calcium supplement manufacturers such as Bayer-owned Citrical as official corporate partners, it is unlikely they will alter their recommendations anytime soon, even despite the increasingly unequivocal evidence that their guidelines (see below) are doing harm. Essentially, what women (and men) need to do with this information is to return to commonsense. First, don’t swallow stones, shells and ground up bone. Second, our bones become less dense as we age for a reason – it is a natural process, and using high-dose calcium, hormone therapy, drugs, or whatever means at our disposal to drive our bones to a denser level than is natural, should be expected to have unintended, adverse health effects. Thirdly, despite the evidence provided by x-rays to the contrary, our bones are not made of chalk or limestone. Our bone is a living, breathing and highly complex tissue, which requires amino acids, vitamin C, magnesium, vitamin K2, regular exercise, and adequate and optimal hormone levels to thrive and maintain structural integrity and strength. Finally, far more important than BMD itself is bone quality, and whether or not folks are actually living in their bodies, aware of their movements, their surroundings, so that when they do fall, they can respond in a way that does not result in harm, or a fracture. This is why vision and gait disorders are far more important than BMD in determining fracture risk. Given all of this, we need to break free of the “calcium myth,” the “bone density myth,” and the myth that our skeletal system is first and foremost an object of biomedical surveillance and treatment, and only second that integral part of the vehicle through which we live. Finally, instead of popping calcium supplements, let’s get back to the nutritional basics. Explore sources of plant-derived bone minerals like Kale, or bone-building broths such as Miso, which modulate the hormonal dimension of bone health in a way that also protects against cancer. Look into plums, or even pomegranate, as these fruits contain great power in decelerating hormone-related bone mineral losses women experience as their ovarian reserve taps out between 40-55. Calcium, while important, is but a singular mineral component involved in the creation of the highly complex, living-and-breathing tissue which is human bone. From the embryonic bone from which its crystallized form is born, comprised as it is of protein, to the complex hormonal factors that help to ensure proper bone turnover, our skeletal health is as a complex as our digestive or neurological health; simply throwing calcium at the problem won’t make our bone, or us, any healthier. PreviousCannabis gum for pain relief: Would you try this?